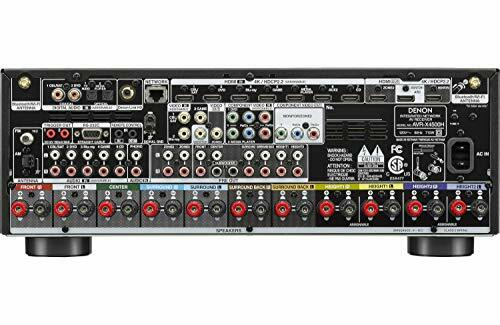 This AVR is the best reason to upgrade your home theatre yet, says Steve May. Read our DENON AVR-X4500H Review. When it comes to orcs, they don’t get more impressive than Durotan, chieftain of the Frostwolf Clan. As wide as a rhino, with tusks that would make a walrus wince, he’s power personified. 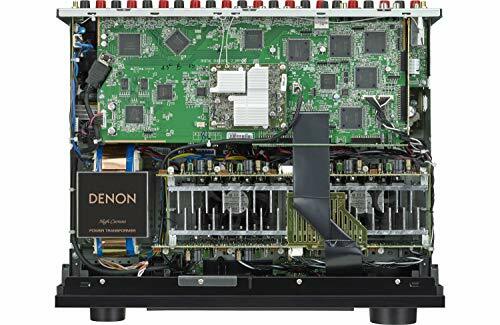 Denon’s AVR-X4500H is similarly impressive (sans teeth). Two hours into Duncan Jones’ Warcraft movie, I was beginning to bruise from its effortless slam. Thank goodness I didn’t choose Creed for this evaluation. 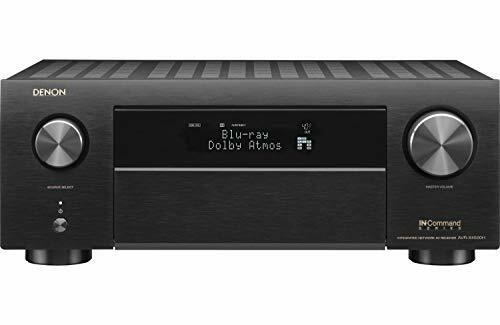 Denon’s latest nine-channel Dolby Atmos AVR not only has the might to do justice to warring orcs, but it offers an impressive roster of functionality, from class-leading connectivity to all-embracing codec support, including standards yet to see the light of day. If you’ve been reluctant to upgrade your home theatre, the AVR-X4500H could finally be the carrot to make you capitulate. There’s certainly no shortage of connectivity here – the rear panel has more ingress than Tokyo station. There are seven HDMI inputs, all 4K/HDCP 2.2 compliant, plus three outputs, two for screen and projector, the third for a Zone 2 feed. All HDMIs support 4K at 60fps, with 4:4:4 colour subsampling, Dolby Vision and HLG HDR support, and BT.2020 passthrough. There’s even eARC (enhanced Audio Return Channel) over HDMI, which opens the door for native Dolby Atmos multi channel passthrough (should you need it) and uncompressed next-gen audio. Officially designated ‘HDMI 2.1 supporting eARC,’ this isn’t a full 2.1 spec HDMI port (we probably won’t see that on AV receivers for at least another year), but unless you’re planning to upgrade to 8K, it’s close enough. Out of the box, the receiver is capable of an immersive audio layout of 7.1.2 or 5.1.4, but there’s 11.2-channel processing available if you have the room, speakers, amplification and inclination to take advantage of it (for this audition, I ran a 7.2.2 configuration). All channels utilise a 32-bit AKM (Asahi Kasei Microdevices) AK4458VN DAC, with a so-called ‘velvet sound’ architecture. This isn’t actually new, having been used on Denon AVRs last year too. The AVR-X4500H also features four digital audio inputs (two coaxial, two optical); five assignable analogue audio inputs; a phono input (for vinyl addicts); two component inputs (for retro game addicts) with one output; plus stereo audio outputs for Zones 2 and 3. There’s even a Denon Link HD jack for owners of compatible disc players. System control is similarly generous, and includes twin 12V triggers, RS-232C and IR remote connections. These, of course, are for advanced setups – more use to some will be Amazon Alexa control when partnered with an Echo device, allowing you to voice adjust volume or switch inputs. As a 2018 AVR, there’s plenty of wireless tech too, including Wi-Fi, Bluetooth, Apple Airplay 2 and HEOS multi room interoperability. Need more connectivity? On the front panel there’s an additional HDMI input (once again 4K/ HDCP 2.2 compliant), plus a USB port. The AVR-X4500H sees Denon embracing a new cosmetic design, although it’s not veered too far off piste. The look is chic, with squared-corner modernity. The front fascia adopts a trapdoor design, with source select and master volume dials sandwiching a bright, clear, text display. The receiver’s headline power rating is 9 x 200W, but this is a 6 ohm measurement into a single channel with 1% THD. A more reasonable starting point is Denon’s 125W (8 ohm/0.05% THD/two-channel) figure. Suffice to say, this monster can get rowdy. An Auto Eco mode is available to manage maximum power should you feel a need to exert some level of responsibility (being irresponsible, I didn’t). variants those platforms cover. Intriguingly, our test sample arrived with a pre-eminent sticker proclaiming the AVR to be IMAX DTS Ready – an IMAX Enhanced firmware update, which unlocks compatibility with the proposed IMAX Enhanced standard, is due in February. Beneath the hood there’s AL32 processing to make the most of multichannel audio, through upsampling with bit-depth extension, with separate discrete digital/DAC boards to maintain performance purity. AVRs can be ornery, but Denon has made an art of setup. A graphical assistant guides you through the process, including room EQ, in this case sophisticated Audyssey MultEQ XT32 calibration. I took full advantage of all the toys, measuring eight positions, and using the internal subwoofer matching mode to ensure a balanced LFE output of my two active subs. It was worth the effort. This top-flight Audyssey iteration is more precise than lesser versions, and does a generally excellent job. The balance achieved between deep bass, sledgehammer mid-range and sparkling detail was immediately apparent. Support for the Audyssey MultEQ Editor app introduces extra calibration flexibility. A familiar barrage of Dolby Atmos test clips, always used to quickly confirm the system was indeed working the way it should, sounded imperious and determined. That painstaking sub-bass matching rewards with an LFE that impacts like a Saturn V liftoff, and the power plant in this receiver is quite something. It pressure-loads a room without even raising a sweat. Sonic steerage is also sensational, as Warcraft (Blu-ray) continually attested. When the orcs first attack (Chapter 4), burly weapon- wielders break in from every corner. An oversized axe cleaves the front soundstage and deep bass rumbles believably. Then a magical blast sends one attacker flying from the front stage, through the trees above my head and into the far right corner of the room. My home cinema was under siege. Of course, great movie sound isn’t just about carnage and rumble. It’s equally about ambience and subtlety. In the aftermath of the orc battle, flies buzz around carcasses, their travels realistically pirouetting above and behind the listening position, with perfect spatial positioning. This is immersive audio done spectacularly well. Similarly, the library sequence (Chapter 3) recreates swirling wind and magical gurgles that echo around its cylindrical walls, hinting of things unseen in the shadows. Emphasising Warcraft’s epic sweep, the Atmos (height) channel is often used to carry Ramin Djawadi’s stirring score, delivered here with authority and grace. This receiver sits between the seven-channel AVR- X3500H and the 11-channel AVR-X6500H, and has been tuned by Denon Sound Manager Yuuki Takahashi. In charge of the brand’s own band of amplification orcs, his previous projects have included the AVP-A1HD, AVC-A1HD, AVC-X8500H, AVR-X7200WA and AVR-X6400H. It replaces last year’s AVR-X4400H, and introduces a number of component changes and upgrades. In particular, Takahashi and his team have reportedly refined the analogue and digital power supplies, and upgraded the HEOS network module to provide a better performance. Various audio presets divide into Movie, Music, Game and Pure niches. These are contextual, changing according to content. And as the AVR offers a full suite of Dolby, DTS and Auro post-processing, there’s plenty of fun to be had experimenting. You’ll also find a limited selection of DSP modes. Four fourth-generation SHARC DSP devices handle the mind-numbing number crunching. Modes like Jazz Club and Rock Arena still sound a little too pre-packaged to really convince, but ultimately it’s a matter taste. Alternatively, you can always opt for Pure Direct with minimal video processing. Multichannel music is intoxicating via this upper-tier Denon. Emerson, Lake & Palmer’s Tocatta (Brain Salad Surgery, DVD-Audio) is a frenetic experience, with Carl Palmer’s percussion conducting hit and run attacks from every corner of the soundstage. The AVR delineates these assaults with crisp precision; Denon AV receivers have in the past had a reputation for warmth, which can sometimes translate into a cloying cloak at volume. That’s not the case here. Detail is laser-etched. Marilyn Manson’s Revelation #12 (Heaven Upside Down, CD) froths with righteous indignation. The track, featuring exhilarating production by Tyler Bates, is layered around a heavily distorted vocal, but the Denon doesn’t allow this fritzz from infecting the hard-rocking downbeat. The analogue presentation even finds air in Manson’s Tattooed in Reverse not easily heard. The source may only be 16-bit but you’d be hard-pressed to identify it as such. 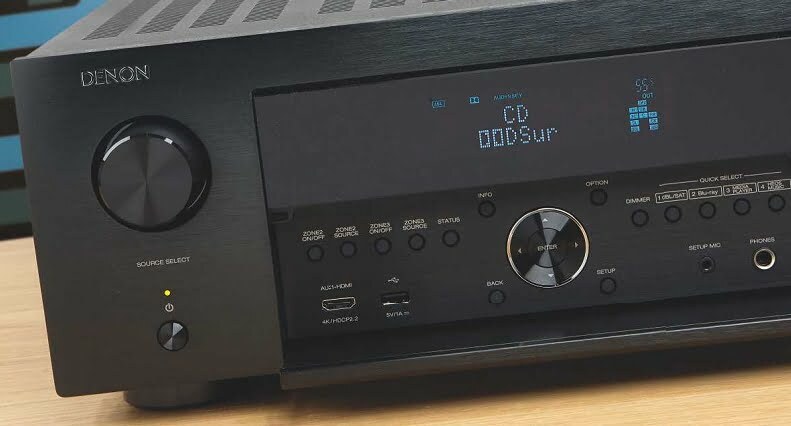 While the AVR-X4500H’s two-channel presentation is peerless, it’s difficult to resist running CDs in Dolby Audio or DTS Neural:X, both of which spread the soundstage wide and high. These modes effectively take Manson’s band out of the studio and onto a live stage. It’s like going to a festival without camping. Easy streaming of music services offers a convenience all will appreciate. 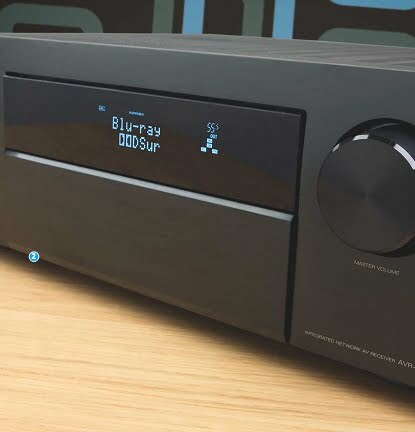 This big box can be fully integrated with a HEOS multi room system; even if used alone the HEOS app offers streaming from Spotify, TuneIn, Amazon Music, Sound Cloud, Tidal and Deezer. Audio file compliance covers ALAC, FLAC and WAV to 24-bit/192kHz, plus 2.8MHz/5.6MHz DSD files. There’s no native support for MQA though, which is about the only negative point I can muster in this review. This Denon isn't just an immersive audio behemoth, it's a top-flight two-channel music machine too. And if IMAX Enhanced takes off, you'll be ahead of the curve. Give your AV receiver a luxury home with this dedicated AV rack from accessories specialist Sanus. It features top/bottom cooling vents, a lockable glass front door, two 3U sections and is supplied with blanking panels.